A stop sign and yellow crime scene tap at the entrance to Sunspot Observatory's entrance Friday morning. The facility was closed due to a security issue. 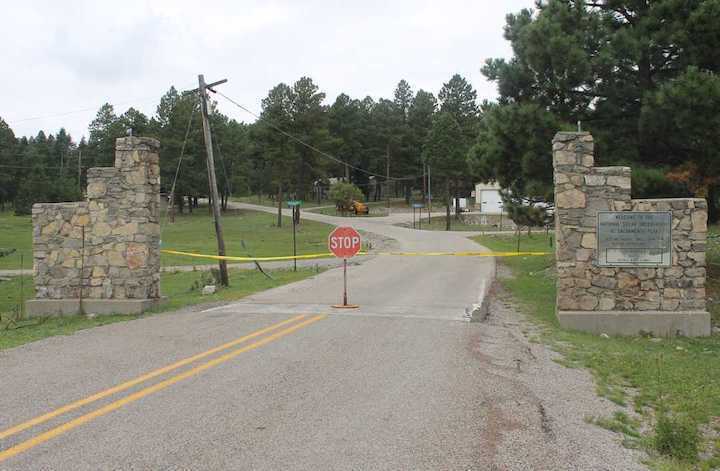 Sunspot Observatory entrance was blocked with a stop sign and yellow crime scene tap Friday morning. The facility is temporarily closed until further notice. The truth is out there – but nobody will go on the record about it. 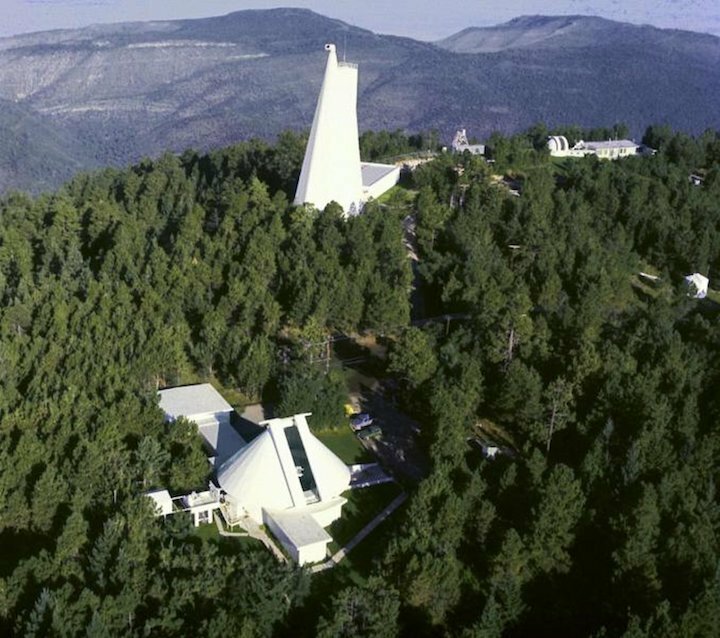 Rumors are swirling and authorities are tight-lipped following the evacuation of an observatory in southwest New Mexico last week. The National Solar Observatory in Sunspot, near Alamogordo, was evacuated last Thursday, along with a nearby post office, and has remained closed since without explanation. 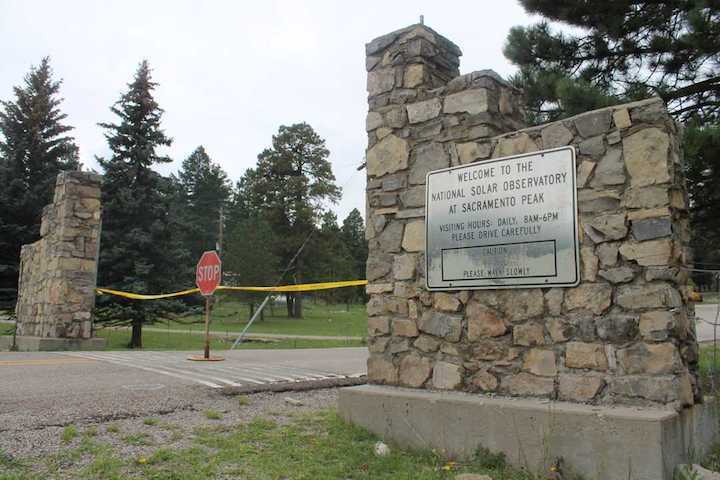 In the Lincoln National Forest, the observatory has been involved in solar research since 1947. Since the closure, the news has spread nationwide with headlines like “I’m Definitely Not Saying It’s Aliens,” and lighting up internet message boards with fervor and speculation. Lifson said AURA is working with the proper authorities, but would not name them. The closure even caught Otero County Sheriff Benny House by surprise. House said they didn’t get any more answers at the observatory, but staff members told deputies the FBI had been there. “Nobody would give us any information on what was going on,” House said, before the phone call cut out and repeated attempts to reach him again were unsuccessful. FBI spokesman Frank Fisher would not confirm or deny the agency’s involvement but referred all questions to AURA. U.S. Postal Service spokesman Rod Spurgeon called the situation “strange” after authorities walked into the nearby post office without warning and told the clerk to evacuate. “I wasn’t present … so I’m not sure which law enforcement agency told us to evacuate,” Spurgeon said. He said no timeline was given on when the office would be able to reopen. Spurgeon said he is waiting on a call, but doesn’t know from whom as he has not heard from any authorities or agency. “It’s shrouded in mystery,” he said. An employee at the nearby Apache Point Observatory said they are also in the dark. “We know about as little as anybody,” the employee said. The employee said people in the area have seen unknown authorities hovering in helicopters and driving up in vehicles. “Nobody would know who they are – you stop them and they won’t tell you anyway,” he said. The employee said there is not enough information to “worry about it,” but the mystery continues to deepen among locals. “That’s what happens when you do something and don’t tell anybody why,” he said. Aerial view of the Sunspot Solar Observatory site on Sacramento Peak in New Mexico. Sunspot is part of the National Solar Observatory, which is funded by the US National Science Foundation. 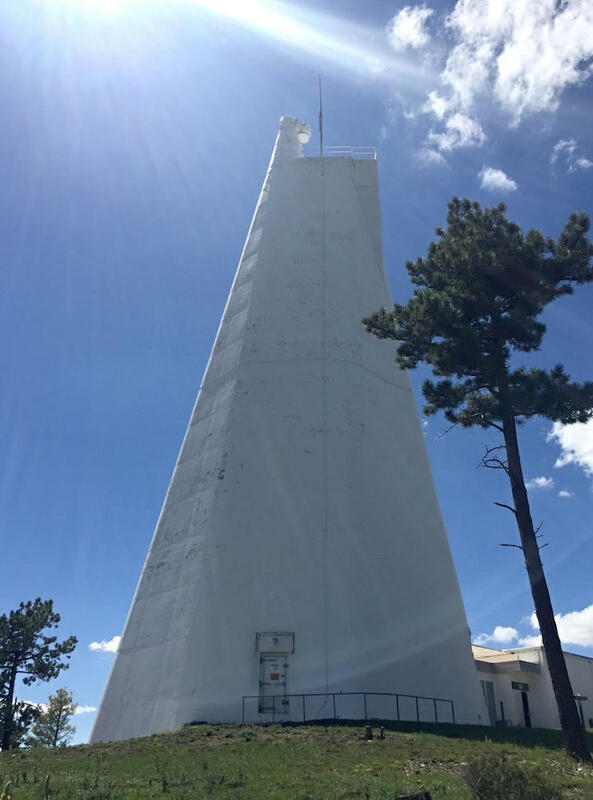 The NSO's Sunspot Solar Observatory, on Sacramento Peak in the southern part of the state, was evacuated last Thursday (Sept. 6), as was a nearby post office, according to the Albuquerque Journal. FBI agents have reportedly been investigating the site, and they're apparently keeping local law-enforcement personnel in the dark. The Association of Universities for Research in Astronomy (AURA), which manages the Sunspot observatory with funding from the U.S. National Science Foundation, hasn't said much, either. The organization released a statement saying that AURA "is addressing a security issue" at Sunspot "and has decided to temporarily vacate the facility as a precautionary measure until further notice." AURA "is working with the proper authorities on this issue," the statement adds, without specifying who those authorities are. And we may not get answers anytime soon. At 2 p.m. EDT (1800 GMT) today (Sept. 14), AURA Corporate Communications Coordinator Shari Lifson sent out an email update, which stated that AURA "has decided that the observatory will remain closed until further notice due to an ongoing security concern." Unsurprisingly, the dearth of information has led to a lot of speculation about what's going on. The rumors range from the downright silly (the feds shut Sunspot down to keep news about a deadly solar superflare from getting into our panicky heads) to the intriguingly believable (this may be an espionage investigation). Observatory team members have shot down one of the more farfetched theories, however. The "telescope did not see aliens," Sunspot Solar Observatory director James McAteer, who's also an associate professor of astronomy, solar physics and space weather at New Mexico State University, told Albuquerque news station KOB4. "All data will be made public in its unaltered form," McAteer added. "Nothing is hidden or kept secret." The FBI hadn't returned a phone call as of press time. The agency has consistently declined to comment on the Sunspot situation over the past week, according to other news organizations. In the wake of the shutdown, Otero County Sheriff Benny House told the Alamogordo Daily News: “The FBI were up there. What their purpose was nobody will say.” Facility employees are similarly in the dark. “We have absolutely no idea what is going on,” says Alisdair Davey, a data center scientist at the National Solar Observatory (NSO). “As in truly nothing, which in itself is just weird.” Messages left with the FBI field office in Albuquerque were not returned. AURA manages the site for NSO, a National Science Foundation-funded group. New Mexico State University (NMSU) in Las Cruces leads the consortium, including NSO and other universities, that operates the observatory’s Dunn Solar Telescope, which conducts routine observations of the sun used by scientists around the world. All buildings on the site have been shut down and the staff of approximately 12 have been sent home, says James McAteer, Sunspot director and an NMSU astronomer in Las Cruces. He says shutdown events are not unusual, because remote mountaintop facilities can be closed due to sewage leaks, downed power lines, or snowstorms. But the Apache Point Observatory, located slightly lower down on the same mountain, remains open. But, Aftergood says, a solar observatory might not be the best place to conduct such activity. “I imagine most or all of its sensors are directed up.” He wonders if someone at the Sunspot observatory somehow inadvertently spotted a classified satellite or transmission, triggering the shutdown. That might also explain why the facility has remained closed for so long, Aftergood says; it could take time to interview all relevant personnel, get them to sign nondisclosure agreements, and do background investigations to make sure they are not foreign agents. While the actual nature of the security issue remains unresolved, the tight-lipped nature of the authorities is only driving more interest. “The mystery is more intriguing than what the ultimate explanation is likely to be,” Aftergood says. An observatory in the mountains of southern New Mexico that had been closed since early September because of an undisclosed security concern is scheduled to reopen on Monday, officials managing the facility said. The Sunspot Solar Observatory no longer faces a security threat to staff, the Association of Universities for Research in Astronomy said in a statement Sunday. The facility closed on Sept. 6. The association has hired a temporary security team to patrol the observatory when it reopens. "Given the significant amount of publicity the temporary closure has generated, and the consequent expectation of an unusual number of visitors to the site, we are temporarily engaging a security service while the facility returns to a normal working environment," the association said. Authorities have not revealed the nature of the security threat the observatory faced. The FBI has referred all questions to the association. "We recognize that the lack of communications while the facility was vacated was concerning and frustrating for some. However, our desire to provide additional information had to be balanced against the risk that, if spread at the time, the news would alert the suspect and impede the law enforcement investigation. That was a risk we could not take," the association said. Located atop Sacramento Peak, the observatory was established in 1947. It overlooks the Tularosa Basin — an expanse of desert that includes the city of Alamogordo, Holloman Air Force Base, White Sands Missile Range, White Sands National Monument and the site of the world's first atomic bomb test. Officials said Sunspot's one-of-a-kind telescope produces some of the sharpest images of the sun available in the world. Data from observations done at Sunspot is sent to New Mexico State University servers and can be used by researchers around the world. After days of fighting rumors about alien visitations, the managers of the Sunspot Solar Observatory in New Mexico say they’re reopening the facility — and have shed more light on the reason for its 10-day security-related closure. The 71-year-old, 9,200-foot-elevation observatory on Sacramento Peak is America’s national center for ground-based solar physics. It’s managed by the Association of Universities for Research in Astronomy, or AURA, under an agreement with the National Science Foundation. It’s also not far from Holloman Air Force Base and White Sands Missile Range. That was just one reason for tongues to wag when AURA and NSF decided on Sept. 6 to evacuate the facility and surrounding homes due to a security issue. A mystery in New Mexico naturally makes some folks think of aliens, in part due to the fame (or the infamy) surrounding the 1947 Roswell UFO Incident. In that case, the initial headlines about a flying-saucer crash in the desert near Roswell sparked decades of speculation that were never totally quelled by the official explanations, which started with a weather balloon and ended with crash-test dummies and experiments to monitor nuclear tests. “AURA has been cooperating with an ongoing law enforcement investigation of criminal activity that occurred at Sacramento Peak. During this time, we became concerned that a suspect in the investigation potentially posed a threat to the safety of local staff and residents. For this reason, AURA temporarily vacated the facility and ceased science activities at this location. “The decision to vacate was based on the logistical challenges associated with protecting personnel at such a remote location, and the need for expeditious response to the potential threat. AURA determined that moving the small number of on-site staff and residents off the mountain was the most prudent and effective action to ensure their safety. The observatory’s staff of about nine employees should be back at work this week. It shouldn’t take long for nearby residents to be back in their homes, for researchers to be back at the Dunn Solar Telescope, and for tourists to be back at the Sunspot Visitors Center. But a full resolution of the mystery will have to wait until criminal charges are filed, assuming that the investigation bore fruit. And if the mystery hangs on with no criminal charges, with no further disclosures, don’t be surprised if Agents Mulder and Scully tackle the Sunspot Incident in a future “X-Files” episode.